The first day was cool with a few drizzles, perfect walking weather, and the Inaugural Walkers, led by Phil Jenkyn OAM, began a 30 day 315 kilometre celebration of the easily accessible beauty and an historic investigation of all points between Barrenjoey and the Royal National Park from North Palm Beach. The vision of Walking Coastal Sydney is to promote public access to, and enhance the appreciation and recreational enjoyment of Sydney’s coastline, harbour and estuaries for the people of Sydney and visitors to the city. The initiative was advanced through a collaboration that began in 2006 between the Walking Volunteers and Sydney Coastal Councils Group (SCCG), who worked together with SCCG Member Councils to identify and map routes to produce a series of brochures and related information. The NSW Department of Planning supported the initiative through its Sharing Sydney Harbour Access Program. We contacted Rob’s office for a comment on this wonderful route and series of walks for those who may be inspired to take a walk this Spring, or at anytime they feel a need to connect with all just a few steps away. “This walk is a terrific showcase of our city’s spectacular natural coastline - which is far too often overlooked and taken for granted.” Mr. Stokes said. 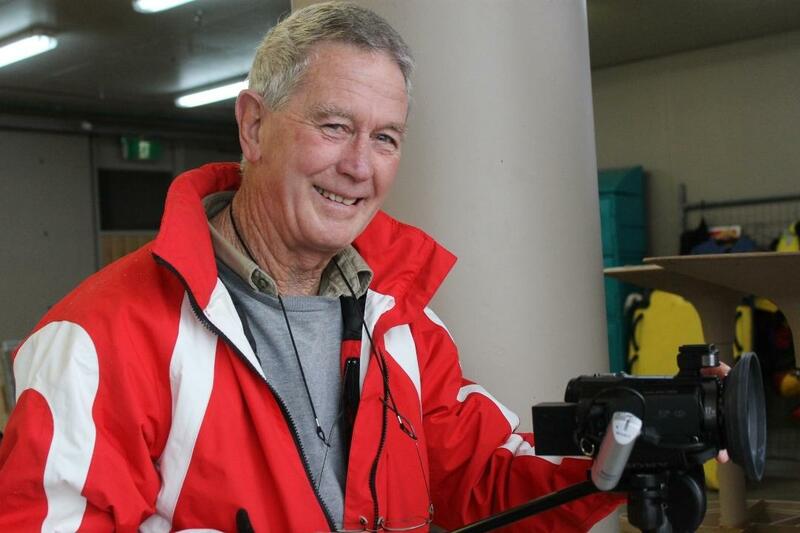 Pittwater’s John Illingsworth consequently filmed and produced a series of wonderful films detailing the walker’s route and giving insights into each point along the way. In mid 2014 Phil Jenkyn, retired barrister and Walking Volunteer, was seeking support from various Sydney councils for the proposed Inaugural Sydney Harbour & Coast Walk. When he contacted Pittwater Council my name was mentioned regarding possible video coverage. Phil's proposal was intriguing - a 30 day non-stop trek of 315 km of the shore line from Barrenjoey to North Head, then along the north side of the harbour to Parramatta where we would cross to the south side and walk eastwards to South Head. From there we'd head south, deep into The Royal National Park. Logistical difficulties would be significant. The entire distance would have to be walked with cameras and associated equipment in a backpack. At the end of each day I would have to return to base to download and check footage and recharge batteries. There was also going to be so much material it would be difficult not to lose track. I requested modest financial support because although the walking would take a month, the editing would take the better part of a year. I would also need additional camera and sound equipment. Phil set about lobbying the various councils for a modest contribution. Had it been possible I would have asked for a year to research and write a script because we would be walking not only around one of the world's greatest natural harbours, but though the history of one of the world's greatest recorded adventures - the European settlement of Aboriginal Australia. From Cook's landing place at Kurnell to Governor Phillip's first journey to Pittwater, then to Parramatta where a failing colony was saved by dubiously successful convict farming. Past the great abattoir at Glebe where the blood and offal of more than a million slaughtered animals a year spilled into the harbour to attract sharks, to Cockatoo Island with it's extraordinary record of convict and maritime industrial history, through some of the great houses of colonial Sydney and on to the submarine boom net that trapped a midget submarine in 1942 while letting two others through that fired torpedos towards Garden Island. Past the swimming pools where a young Dawn Fraser, Fanny Durack and Mina Wylie trained for Olympic gold, past the Gap where the Dunbar sank with the loss of 121 lives in 1857 and the Hornby lighthouse that was built so that it would never happen again. Along Coogee beach with it's remarkable history of shark attacks, shark nets and shark arms and onto La Perouse with its Depression-era settlements. Though all of this we would find, with the benefit of just a little knowledge, Aboriginal middens, rock carvings and the resting place of Bennelong, and meet some of modern Sydney's Aboriginal people including elders. We would also experience the landscape of Dreamtime mythology as we trekked the Royal past Wattamolla inlet where Mathew Flinders and George Bass were saved from almost certain death on a storm wracked coast. But there was no pre-production time for research, it had to be done as part of the editing process. Phil had organised accommodation before we started out. Some venues offered attractive terms so wherever possible I included a small promotion as a thank you. Because councils were supportive there’s also a scene with the mayor or councillors whenever possible but there had to be a story. At Mosman Mayor Peter Abelson walked with us past Wyargine Reserve where a significant court battle saved the reserve from private ownership, a recurrent theme in the course of our walk around the harbour foreshore. Notionally I was working for Phil but in reality I had complete autonomy and editorial control. Phil just indicated the themes he thought important - walking, natural history and Aboriginal connection, aspects of the landscape reasonably well versed in. I'm particularly interested in what I call the 'Aboriginality' of Sydney, the copious body of evidence that shows us just how long the First Australians have been here, and how significant was the effect of their occupation. Two cameras were used - a Sony NX30 and a Sony action-cam. I also carried two digital voice recorders. When shown around by a local historian or National Parks ranger I'd put one into their breast pocket so that all sound was recorded whether or not the camera was running. Sometimes I'd use both recorders simultaneously on different people. These recordings proved invaluable for voice overs. The main Sony NX30 camera has excellent image quality and low-light capability and, most importantly, gyroscopic controlled optical image stabilisation which makes it possible to hand-hold a full telephoto shot without significant wobbling. In fact no tripod was used for the entire series. But this camera couldn't get wet so when the rain came bucketing down I shot on the small action camera, just wiping the raindrops off the lens with my shirt as necessary. There wasn't any 'setting up' of shots. I would have to run ahead to get the approaching shot and trail behind to see the walkers disappear into the distance. It was essential to also capture whatever interesting native plants were in flower and any native animals. At times I'd find myself a kilometer behind and would have to run to catch up and repeat the process. This intense hands-on type of shooting lends a sense of immediacy, a feeling that you are really there. But the challenge was to find interesting people who could educate us as we walked. Dr Peter Mitchell was outstanding, on one occasion taking us to where Bennelong was buried more than 200 years ago. Astonishingly this great Australian lies beneath a simple street sign on a very ordinary corner in suburban Putney. David Eager, one of the walkers, came prepared with a tablet onto which he had downloaded a modern recording of the song that Bennelong and Yemmerawanne performed when in England. Peter Mitchell told the story and we listened to a song written down and annotated at the live performance around 1794. It was deeply moving and the film captures this. At the end of the day I tried to capture Sydney as I see it - through an environmental, historical and Aboriginal lens. I came away with a much deeper appreciation of just what a remarkable city Sydney is, and how precious is its harbour and coastline. I think the shot of the darter mimicking the wings of the Opera House, even down to the colour, shows that wonderful juxtaposition of nature and art that we sometimes find in the harbour. Perhaps the greatest marvel is that the Opera House sits where the first brick building in Australia was built by Governor Phillip for Bennelong, and the eucalypts that tower above the Opera House - the Bennelong Twins - witnessed those events and still thrive today. Walking this journey brought home just how marvellous a city is Sydney, for as Circular Quay - Sydney Cove - grows nearer so too does the density of Australian history, culture and pre-history. It is a massive challenge to not obliterate this, to keep our middens and rock carvings, our sacred trees and convict relics too. They should not become another Tank Stream. Australasian darter or Australian darter, Anhinga novaehollandiae - This family is very closely related to the other families in the suborder Sulae, i.e. the Phalacrocoracidae (cormorants and shags) and the Sulidae (gannets and boobies). Cormorants and anhingas are extremely similar as regards their body and leg skeletons and may be sister taxa. In fact, several anhinga fossils were initially believed to be cormorants or shags. On behalf of the Inaugural Sydney Harbour & Coastal Walk Steering Committee I would like to thank Pittwater Online News for its incredible coverage of the Inaugural Walk and of John Illingsworth’s daily films. Pittwater Online is a remarkable website, the amount of useful and informative material for the local and wider community is amazing. Your issue on the official start of the Walk by Minister Stokes, was informative, detailed and accurate, and set the scene for what was to come. What John has done is quite remarkable, I know of no one who has covered an adventure like this - walking with us, capturing it on film as we go, and then producing an edited version that is so real to the actual experience. He is a one off, as you probably know. The walking network had previously been launched by the then Premier the Hon Barry O’Farrell in September 2011 – there is a video of the launchhere. The 315 km 30 day Inaugural Walk was an incredible success as can be seen from the material below. This foreshore walking route within the boundaries of the City of Sydney compares favourably with any walking route in any City. We should be very proud of what we have here and seek to promote and enhance this great natural and cultural asset for the community and the State. The aim of the Inaugural Walk was not to encourage everybody to do the whole walk in one go. The aim was and is to promote the existence of this incredible foreshore walking route and to encourage residents and visitors to explore sections of it of their own choosing. The Walk has obvious benefits in many areas – including stimulating awareness of our environment and history, improving community health both physical and mental, encouraging tourism and the use of public transport, and improving our economy. John’s films can be viewed both on your website www.pittwateronlinenews.com and on YouTube here. In relation to the Inaugural Walk David Eager’s insightful daily blogs can be viewed here and Matt McClelland’s and Ian Napier’s photos and video clips here. 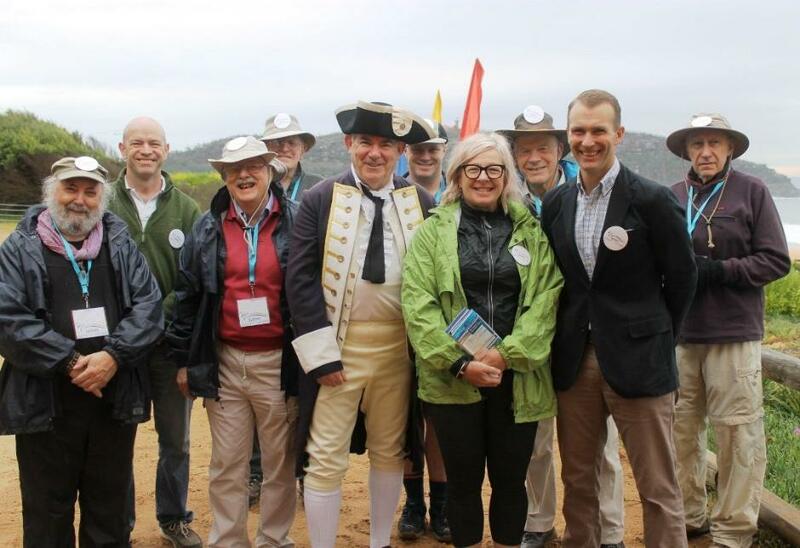 The year 2014 in Sydney involved three important conferences relevant to the Sydney Harbour & Coast Walk, and relevant generally to walking and national and marine parks. These were the Walk21 International Conference in October, the IUCN World Parks Congress in November, and the Marine Forum: Celebrating Sydney's Marine Environment also in November. The Forum was a Parallel Event to the World Parks Congress. A presentation by Tara Wells and Matt McClelland on behalf of the three of us called Connecting People with Parks: How tourism connects a new generation to nature was made to the IUCN World Parks Congress on 17 November 2014 – you can see this here. The Joint Proposal that was accepted for the Congress and the speakers notes for the presentation are attached. I gave a Paper on 9 November 2014 to the Marine Forum: Celebrating Sydney's Marine Environment, titled ‘The Ongoing Battle for Sydney’s Harbour and Coast’ – the video can be viewed here. A short video of the Day may be seen here and as embedded below. The Forum was organised by the National Parks Association of NSW. We thank Pittwater Online News again for your support. The waters around Sydney are world renowned for their natural beauty, serving to draw millions of tourists to the city and supporting a multitude of industries. For over 200 years our state has benefited from the riches our marine environment provides. But decades of overfishing and pollution have caused fish populations to plummet, and even led to the extinction of some species. John Illingsworth at the start of the Inaugural Sydney Harbour and Coast Walk 2014 - AJG Pic. Land’s Edge provides unique outdoor education programs for schools in a number of wonderful locations in New South Wales, Australia. This film features a presentation made to The Walking Volunteers during the 30 day 315 km Inaugural Sydney Harbour & Coast Walk in August 2014. The Walking Volunteers fully support the Land's edge program - see www.landsedge.com.au for further information. INAUGURAL SYDNEY HARBOUR & COAST WALK - DAY 1 - BARRENJOEY TO AVALON BEACH by John Illingsworth - over the next few months Mr. IIlingsworth is allowing us to share his wonderful films on this wonderful experience and the history and beauty encountered along the way!